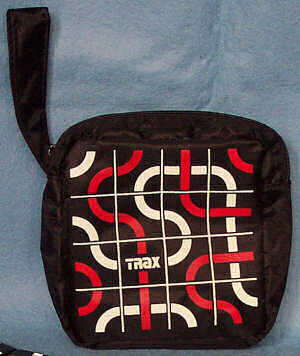 TRAX can be played anywhere that you have a flat surface. Nothing beats the tactile feel of real tiles, and the game itself when played over the table. TRAX is available internationally (enquire for details). 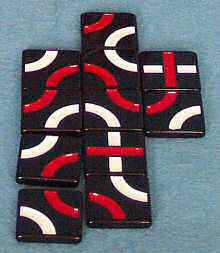 TRAX is a game that is limited only by the player's abilities, experienced players and tournament players may wish to consider getting more than one set. TRAX makes a great gift idea! The 64 tiles come packaged in a sleek nylon travel bag. Each bag contains a booklet with rules and strategy hints. Each tile has hand painted indented red and white straights and curves. Each tile has straights on one side and curves on the other.